1. Energy Storage Systems are a HOT Topic! Energy storage systems (ESS) will be a part of many new and existing buildings in the next decade. They use large batteries to store energy purchased at lower rates and then use it when utility energy is more expensive. The technique—called peak shaving—can be used in homes, commercial buildings, and industrial facilities. No building category will be untouched and focus was placed on how these systems can be used safely. There were three sessions on ESS at the conference. Howard Hopper from UL gave a great overview presentation on the topic. A key theme was that new ESS technologies and applications are arriving before code requirements can address potential hazards. Mr. Hopper went on to outline the current building code proposals dealing with ESS, while other presentations included electrical installation concerns and hazard assessment of lithium-ion battery-based ESS equipment. Exponent’s hazard analysis presentation indicated that gas detectors might be used for a leading indicator of thermal runaway—a precursor to fire. The research found hydrogen fluoride, methane, and carbon monoxide are off-gassed before a lithium-ion battery cell overheats. I anticipate we may be installing fixed gas detection systems for ESS rooms in the future. Additionally, I learned a reliable extinguishment method has not yet been discovered for fires in lithium-ion battery ESS systems. Sprinklers, water mist, and clean agent systems have been applied but none have been successful in addressing fires in all failure modes of batteries. The only reliable—albeit highly impractical—method is bathing the cells in 3M's NOVEC 1230. Lithium-ion cells in a NOVEC bath have been shown to avoid a cascading failure of the battery array, but commercial application of this prevention method at-scale has not been developed. More to come on this subject! Eric Forssell, a Senior Engineer with Jensen Hughes, presented on Gaseous Clean Agent Suppression Systems Applied to High Air Flow Environments. This was a presentation of the findings of a Fire Protection Research Foundation project. The project builds upon previous data center-focused fire protection research and seeks to understand the impact of high HVAC system air flow on clean agent distribution. The presentation outlined the research plan for phase two, where multiple clean agent discharges will be modeled using computational fluid dynamics (CFD) software in both large and small data centers. The effects of aisle containment will also be studied. Accuracy of the CFD models developed will be validated by a handful of full-scale discharge tests. Many of the phase one project sponsors stayed to discuss the results and hopes for the success of phase two. The second phase of research is currently planned for completion in 2018. The Xtralis® VESDA-E VEA is a groundbreaking air sampling smoke detector. It is purpose-built to compete with addressable photoelectric detectors in “normal” smoke detection applications, but with the benefits of aspirated detection. The VEA can give location information on the smoke just like any addressable device. This product is still in its debut years and many engineers are just beginning to realize its unique benefits. One benefit of the VESDA VEA is the reduced visual impact of sampling point in the ceiling. Sampling points are installed in the finished ceiling surface and where air is drawn back through tubes to the detector to be tested for smoke. I saw several new installation accessories at NFPA this year. Mark Schofield, Technical Services Director with Xtralis, showed me the sampling point options. There’s now a ceiling mounted point with a clamp mount for lay-in ceiling tiles and a sidewall port for when the sampling tube cannot come into the back of the point. Also, sampling points now come in white and black. As of January 1, 2016, a new clean agent system installation requirement went into effect for supervisory position monitoring of control devices. The new requirement makes systems more reliable by generating a supervisory signal at the suppression system control panel whenever a control head, operator, or solenoid is physically removed from an agent storage cylinder. At NFPA, most of the clean agent system manufacturers exhibited their solutions. Each one is unique to the manufacturer. As these devices begin to be installed on new systems, let’s hope clean agent users see their benefits and retrofit existing systems with them too. At the conference, I was very impressed with Victaulic. They had some great new products for the sprinkler industry. The first product I noticed was their FireLock™ Installation-Ready™ fittings. These are innovative grooved fittings with integral couplings. Thus, when you climb a ladder to install the fitting on the piping system, you only need the fitting and a socket-equipped cordless drill. The result is fewer pieces to assemble the fitting, less steps, and less to carry. The second thing I noticed was their new VicFlex™ Dry-Sprinkler. It’s a dry sprinkler, but it’s flexible. The water is held at the connection to the pipe main. Victaulic’s display showed how it could be installed in residential construction for a sidewall sprinkler underneath a wood deck—flexible enough to make it from the ceiling joists down into the wall all the while being freeze-proof. A very innovative product, but their employees were tight-lipped about the construction. Maybe they’ll let us know how it works in the future. EXXFIRE™ is a new manufacturer who has brought their commercial product to market recently for in-rack suppression systems. They’d exhibited at the NFPA Conference in the past while the product was under development, but this year they were able to exhibit their commercially available product, the EXXFIRE 750. The EXXFIRE 750 is a rack-mounted suppression product that produces nitrogen gas to flood the cabinet it’s installed on to extinguish the fire inside. It has an air sampling smoke detector built into the unit for a complete detection and suppression package to mount on the rack. It will be interesting to see how use of this product will grow in the future. 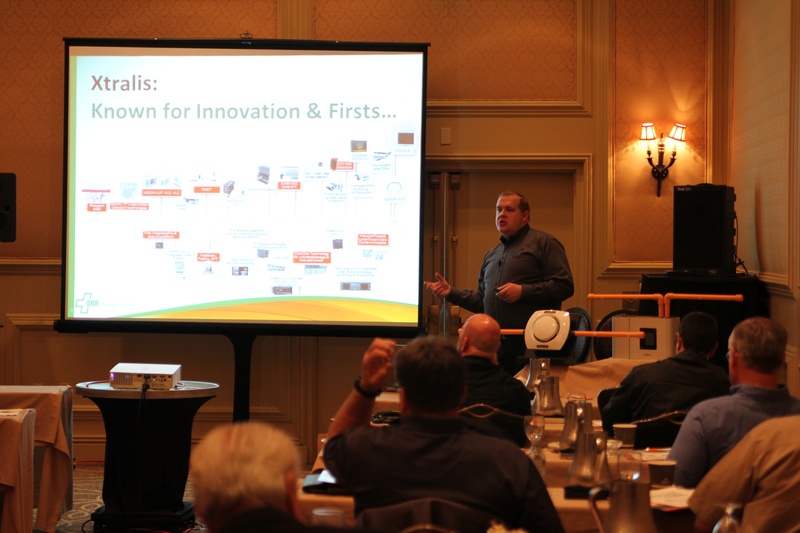 On Monday, there was a panel presentation on next steps for the industry in reducing unwanted fire alarms. The panel represented a broad cross-section of stakeholders in the issue. An article summarizing the panel discussion is available on the NFPA website. Reducing false alarms has been a focus of both the fire service and the alarm industry well before 2009, yet year-over-year, we see a growing number of fire departments responding to automatic alarm calls that are not emergencies. In 2004, NFPA reported nearly 2.5 million false alarms in the United States. Alarm industry representatives stated most systems that are properly installed by a qualified contractor (meaning, not the lowest bidder) and properly maintained do not contribute to the overall problem. Essentially, this discussion signals a re-focus on the problem and interest in changing the handling of automatic alarm calls towards alarm verification systems. It was a reminder to the industry that new ideas are needed and an invitation for public input to enhance the next edition of NFPA 72, the National Fire Alarm and Signaling Code. The next NFPA Conference and Expo will be held in June 2017 in Boston, MA. ORR Protection Systems will be at that conference too. Please stop by our booth to visit and learn about the services we offer for Mission Critical Fire Protection.